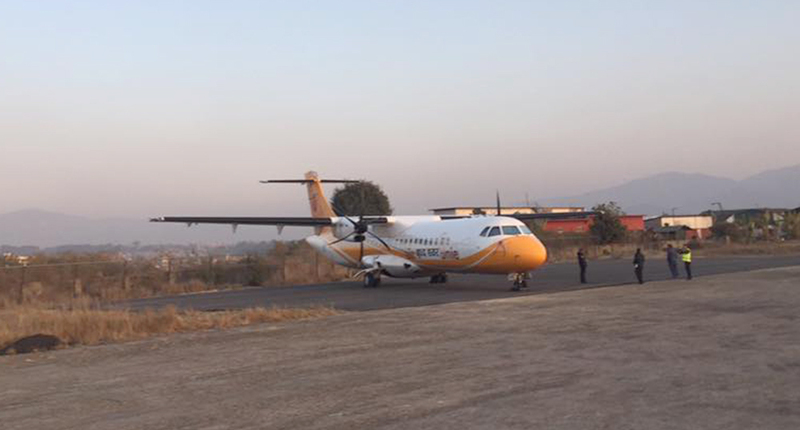 KATHMANDU, March 7 : Buddha Air has pressed its new ATR 72-500 aircraft into commercial service. The domestic carrier had acquired the aircraft on February 7. It is configured to carry 72 passengers. “The aircraft is environmentally friendly and consumes less fuel compared to other aircraft. Spacious cabin and ergonomic seats with enough legroom ensures a comfortable flight for passengers,” Buddha Air said in a statement. Buddha Air has nine aircraft -- two Beechcraft 1900Ds, three ATR 42-320s and four ATR 72-500s - in its fleet. The airline plans to increase flight frequency to Bhadrapur, Biratnagar, Nepalgunj and Dhangadhi from March 14 onwards.